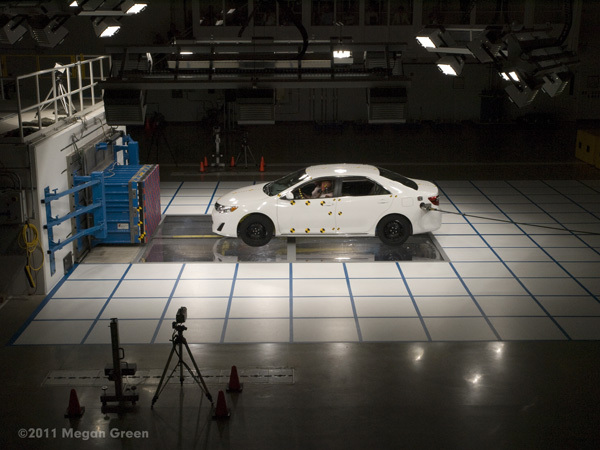 As part of a new era of openness mandated from CEO Akio Toyoda , Toyota opened their doors to the media at their Collaborative Safety Research Center (CSRC) at the York Township, Michigan Toyota Technical Center (TTC) for the first time in company history. Collaborative research partners including representatives from MIT, the Transportation Active Safety Institute, Indiana University/Purdue University Indianapolis, Virginia Polytechnic Institute and State University (VT), Wake Forest School of Medicine, Washtenaw Area Transportation Study, Wayne State University School of Medicine, and University of Michigan Transportation Research Institute were on hand for the announcement of ten new safety initiatives. Toyota’s goal is to share technology and research results from the various studies with the automotive industry and public. To further support this effort, they launched a new website www.toyota.com/csrc in January where this collaborative research on automotive safety is available online. A significant portion of the research is concentrating on the most vulnerable populations, which, in their eyes, are young children, new teen drivers, seniors, and pedestrians. Teenagers are considered vulnerable because their brains are still developing as well as being inexperienced drivers. An example of some of the research being conducted is a three-year project with Virginia Tech Transportation Institute to develop driver coaching and feedback via five in-car cameras that monitor what the driver is doing and interacting with, beginning when the teen first gets his or her learning permit. Data from the cameras is downloaded every night using a wi-fi connection, but sensors are also installed with this system to alert the driver when risky behavior occurs, e.g. hard braking or swerving or the presence of alcohol. Report cards will be generated and be accessible to the parents for discussion with the teen subjects about driving mistakes and habits. 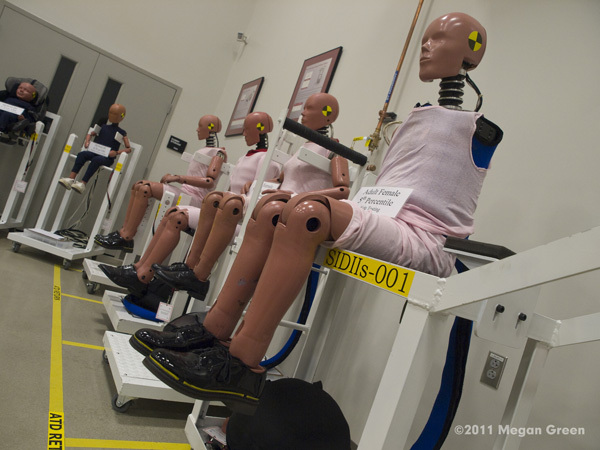 Severity of injuries in crashes are affected by seat and seat belt position, posture, and body shape. In addition, a child’s body structure is vastly different than that of a younger adult, as is that of a senior person. 3-D Computer models representing the developmental stage of a 10-year old child and a 65 – 75 year old female are being developed with partner Wayne State University for a better understanding of how the bones and organs of these age groups are injured in accidents. As we age, our field of vision decreases; the quantity of information drivers seniors absorb is reduced by 30%. A three-year research project in conjunction with Virginia Tech Transportation Institute will measure the effectiveness of brain training – video games identifying flashing objects on the periphery of their vision – on improving Useful Field of View in seniors. 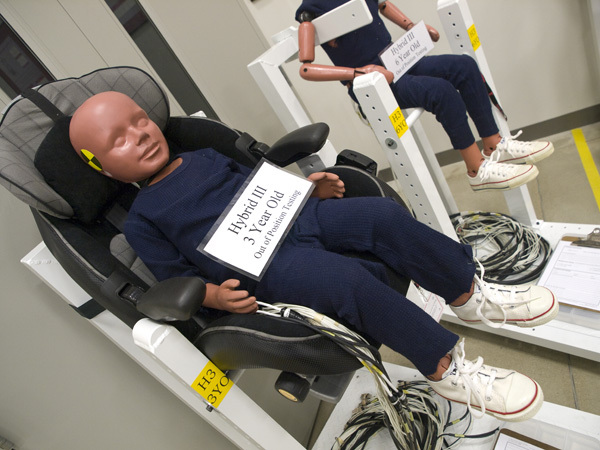 In addition, the partnership with The Children’s Hospital of Philadelphia (CHOP) collects real world child-specific crash and injury data, and The National Child Occupant Special Study (NCOSS) created subject contact and consent procedures to gather specific data – including age if child and type of in-car restraints – about real- life crashes and injuries with the ultimate goal of changing national child safety regulations.